When you come see Scotty Thurman and the Perfect Trouble Band perform, it is guaranteed that you will have a damn good time. Their incomparable sound ranges from slow, hold me close dance tunes to hard-core, red dirt Texas country, infused with rock ‘n’ roll. Each one of The Perfect Trouble Band members are definitely a key part of what makes their shows so great and unforgettable. Each one having their own individual stage presence, you can’t take your eyes off them. One can’t help but be in awe and immediately fall in love with their unique brand of music. 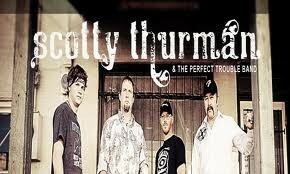 Scotty Thurman, of Gainesville Texas, grew up on outlaw country music and fell in love with it. He started singing in the army. Shy about singing in front of people, he was brought out of his shell when his friends put him on the spot at a local club. The crowd loved it and so did he. Shortly after he was out of the army, he had life changing brain surgery that left him partially paralyzed. He never stopped loving music and re-taught himself how to play guitar. His amazing voice and powerful songwriting stand out amongst all others, drawing the crowd into the feeling and emotion each song evokes. Matt Beaver, of Muenster Texas, plays drums with the passion and energy of legends and with his fun-loving personality, you never get a chance to walk away. He started playing when he was 9 and would sit in his room obsessively playing to the radio until he was 16 years old. He then started playing drums with his friends and decided this is what he wanted to do. He has played with such bands as Only In Texxas and The Johnny Fred Band, before joining the Perfect Trouble Band. His music has been inspired by punk rock, alternative rock and Red Dirt Country. Shawn Scheller, lead guitarist out of Bellevue Texas, taught himself and has been playing guitar now for over 20 years, in all genres of music. He’s played with the likes of the Bois D’Arcs, Uncle Rummy & Gobble Holler Symphony, just to mention a few. His infectious guitar riffs are unbelievable, with his rock roots infused into the unique sound this band has. You can’t help but take notice when he plays. Influences range from Van Halen to Robert Earl Keen to Waylon Jennings and just about everyone and everything in between.